58 Landscape Architect and Specifier News executions of all the gardens from the nursery for over 20 years. Since graduating from the university in 1980, he has been a member of the ABAP (Brazilian Association of Landscape Architects) www.abap.org.br . 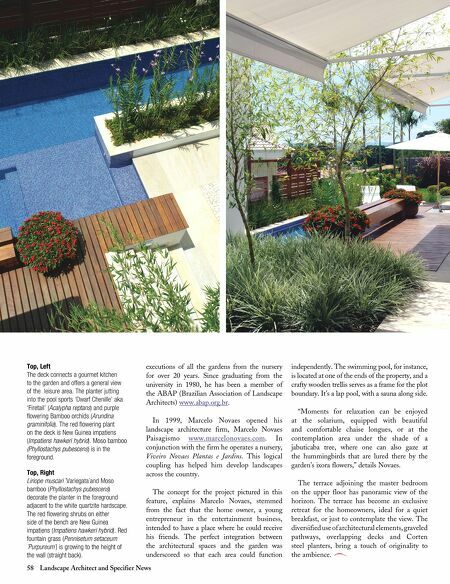 In 1999, Marcelo Novaes opened his landscape architecture firm, Marcelo Novaes Paisagismo www.marcelonovaes.com . In conjunction with the firm he operates a nursery, Viveiro Novaes Plantas e Jardins . This logical coupling has helped him develop landscapes across the country. 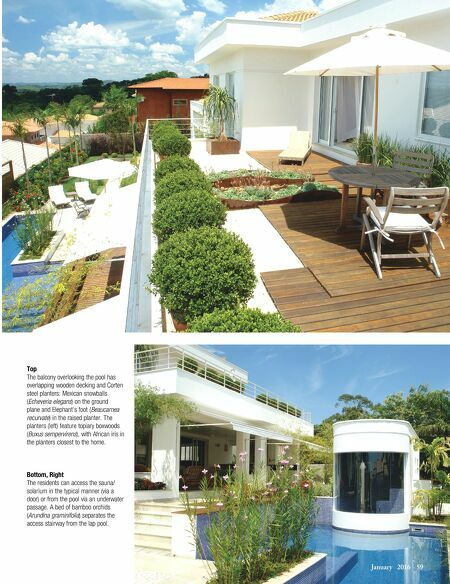 The concept for the project pictured in this feature, explains Marcelo Novaes, stemmed from the fact that the home owner, a young entrepreneur in the entertainment business, intended to have a place where he could receive his friends. The perfect integration between the architectural spaces and the garden was underscored so that each area could function independently. The swimming pool, for instance, is located at one of the ends of the property, and a crafty wooden trellis serves as a frame for the plot boundary. It's a lap pool, with a sauna along side. "Moments for relaxation can be enjoyed at the solarium, equipped with beautiful and comfortable chaise longues, or at the contemplation area under the shade of a jabuticaba tree, where one can also gaze at the hummingbirds that are lured there by the garden's ixora flowers," details Novaes. The terrace adjoining the master bedroom on the upper floor has panoramic view of the horizon. The terrace has become an exclusive retreat for the homeowners, ideal for a quiet breakfast, or just to contemplate the view. The diversified use of architectural elements, graveled pathways, overlapping decks and Corten steel planters, bring a touch of originality to the ambience. Top, Left The deck connects a gourmet kitchen to the garden and offers a general view of the leisure area. The planter jutting into the pool sports 'Dwarf Chenille' aka 'Firetail' (Acalypha reptans) and purple flowering Bamboo orchids (Arundina graminifolia). The red flowering plant on the deck is New Guinea impatiens (Impatiens hawkeri hybrid). Moso bamboo (Phyllostachys pubescens) is in the foreground. Top, Right Liriope muscari ´Variegata´and Moso bamboo (Phyllostachys pubescens) decorate the planter in the foreground adjacent to the white quartzite hardscape. The red flowering shrubs on either side of the bench are New Guinea impatiens (Impatiens hawkeri hybrid). Red fountain grass (Pennisetum setaceum ´Purpureum´) is growing to the height of the wall (straight back).